OMG! Dingdong Dantes just posted a photo of Marian Rivera with their baby boy, Jose Sixto G. Dantes IV. What an angel! According to Dingdong's post, Marian was in labor for 10 hours before she gave birth to Baby Jose Sixto at 1:35 p.m. today. It feels like just yesterday when the couple confirmed they were expecting baby number two, back in November 2018. Now, Zia is officially an ate! In January, we found out that the latest addition to the Dantes family would be a boy. At that time, we were also guessing that they were going to name the baby after Dingdong, and we were right! Back then, Marian said that based on a 4D ultrasound scan, the baby looked more like Dingdong. It's hard to say based on the photo they've released so far, so we're excited to see more of Baby Jose Sixto in the coming days! In February, Zia made us all go "aww" during their baby shower. “I want to take care of my baby brother and love my baby brother," she said. Fast forward to earlier this month, when Marian released their biker-themed maternity shoot photos care of photographer Pat Dy. And now Baby Jose Sixto is finally here! We're so happy for the Dantes Squad. 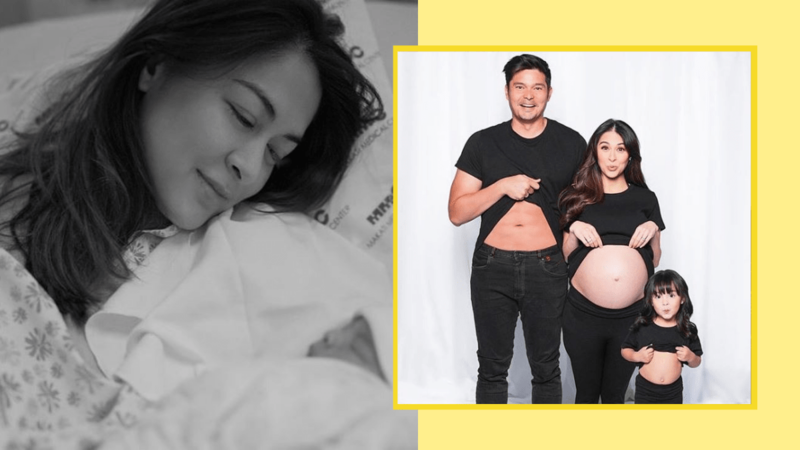 Congrats, Dingdong, Marian, and Zia!